The announcement from Lund University, regarded as one of the top 100 higher education institutions in the world, described Micklavzina as an educator who “combines physics with the circus and theatre, and has developed an extensive repertoire of exciting ways to demonstrate physics in public contexts.” His informal science presentations compliment the teaching that goes on in the classroom. Micklavzina is an icon for physics education in Willamette Hall, or for any student who took a physics class at the University of Oregon. He’s been working here since 1985, after shelving his idea of earning a doctorate in physics when an opportunity to manage the physics demonstration room came open. He'd already been running the room while earning his degrees, and he took the job on one condition: that he could also teach. The university agreed and he’s been on the faculty ever since. He was the first nontenured teaching faculty member in the department, and he appreciates that he’s felt the same support as his tenure-track peers. Thanks to that, he’s been able to build the university’s reputation on an international stage while also bringing knowledge back to Eugene. He credits all those years as a grad student and early in his career working with faculty members on their demonstrations, combined with his natural curiosity and love of tinkering, with driving him to look for better ways to teach science. Micklavzina has a knack for communicating physics by making it more visual. “If they are entertained, you click open a mind there, in a show, an exhibit or even in a lecture,” he said. Now, he’s one of the best in the business. His lectures can seem like performances, which is something he also does when he takes science to the public. He uses common phenomena to describe physics principles. 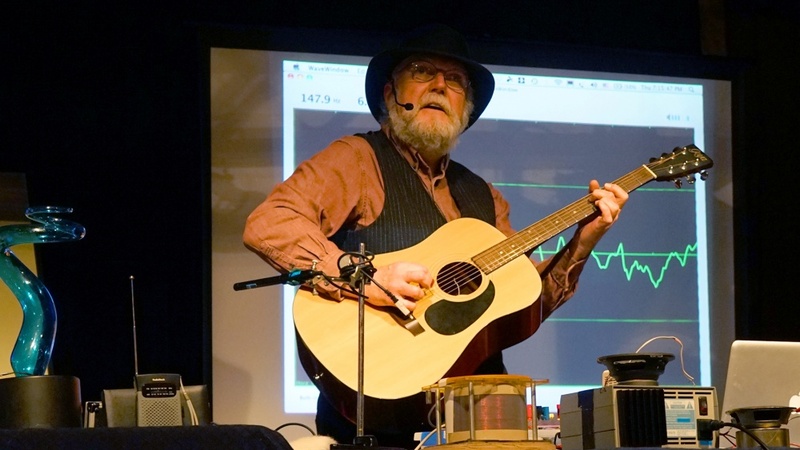 He can demonstrate the interaction of electricity and magnetism by showing how speakers, microphones and guitar pickups work to show how the culmination of physics phenomena turns into rock ‘n’ roll. In 2002 he wanted to take a sabbatical to expand his experience for teaching physics along with expanding cultural understanding of education. The chance email to a Duck alumni he studied with in graduate school, Stacey Sorensen, connected him with a great opportunity in Lund. The timing was perfect. They were looking for someone to help design exhibits at MAXlab, the Swedish Synchrotron Radiation laboratory. He consulted with staff and scientists and developed hands-on displays for visitors coming to the lab that showed the type of research being conducted at the lab. He also developed experiments that MAXlab staff could take on outreach excursions to local schools and the community. In 2012, a combination of large laboratories were being built in Lund — MAX IV and the European Spallation Source that again created the need for public communication. He took another sabbatical and went back to Lund and worked with the MAX IV and the Vattenhallen Science Centre, a public facility associated with Lund University. He played a major role in the creation of a hands-on exhibition named “Shoot Protons and Tickle Electrons” at the center that illustrates the research at the new laboratories. In one display, they devised a way to explain how the national lab’s particle accelerator works by using electromagnets to fire a metal ball through a clear tube. To jazz it up even more, they added a second tube so kids can race the two balls. He also developed the “Quantum Show,” a physics demonstration show that illustrates concepts about waves, energy, light, color, and high-energy light, the basic tools for research at MAX IV. Also commissioned was his wife, Diane Sandall, another Duck alumna, to create a large painting that displayed light interacting with matter that is part of one of Micklavzina’s exhibits. He’s also made numerous other visits to Lund to collaborate with colleagues teaching physics and developing educational methods for the classroom. His work there led to invites to run teacher workshops at conferences and perform shows at science festivals in the EU and Mexico. He has been invited to return many times to Slovenia, where he has family roots, and participate in Znanstival, an annual festival where science is performed in the streets of Ljubljana. Closer to home, Micklavzina lectures and has visited countless classrooms and performed his demonstrations at events throughout the community. Last year, he was part of “Tesla: Light, Sound, Color,” a stage show about Nicola Tesla. Micklavzina provided the science component in a show produced by The Harmonic Laboratory, comprised of UO colleagues from the School of Music and Dance and the College of Design. “To me, that was the ultimate performance,” he said. This isn’t the first high-profile award for Micklavzina, who won the Homer L. Dodge Distinguished Service Award from the American Association of Physics Teachers and was awarded a Sigma Pi Sigma award for his dedicated work with undergraduate physics majors.